Summary: Oil painting showing a young boy sat outside a house. 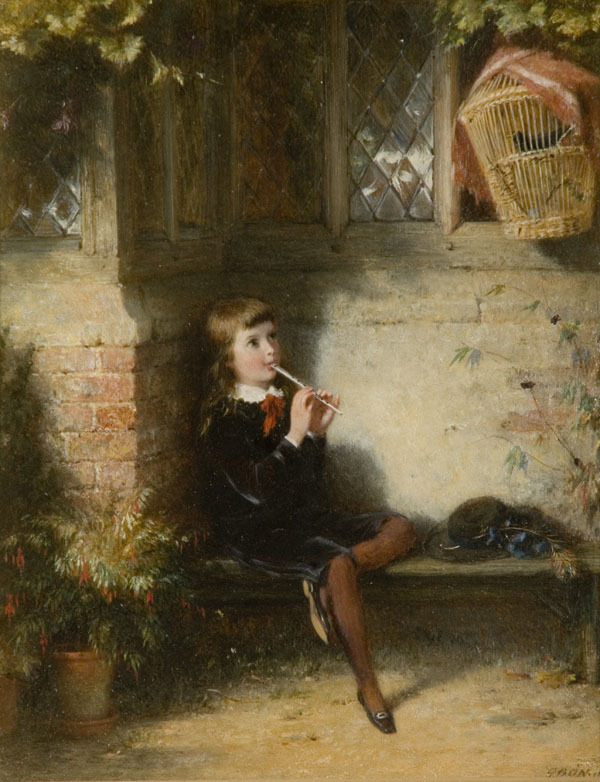 He is playing a recorder to a bird that is in a cage hanging above him. 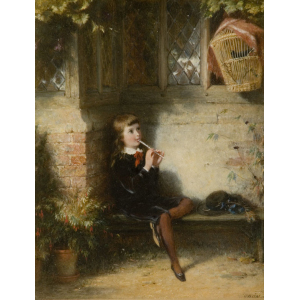 Description: This charming and sentimental painting shows a pretty boy playing a flute, sitting on a bench in the alcove outside a house. The boy's long hair, his velvet costume and wide brimmed hat with peacock feather, and his silver flute are based on the costumes of the time of King Charles I, and give this painting a historic feel. The old brick wall partly covered by ivy and the medieval glass windows in the background are in fact of the walls of Old Wilsley House, which members of the Cranbrook Colony rented from 1859. Full of historic and romantic associations, the house provided inspiration for the artists, and its stone walls and arched doors can be recognized in many of their paintings. Reproduced or Engraved: The Cranbrook Colony, 1977 (p138)?